Earl Lewis actually owned a '67 Pontiac GTO he purchased new in the fall of that year. After five years of ownership, he sold the car, and then he acquired this one, our featured car, 31 years later, in 2003. After investigating several GTO's both near and far, he ended up finding this one only two miles from his home. Earl Lewis’s love affair with the Pontiac GTO began way back in 1967, when he went to pick up a friend to give him a ride home. The friend worked at a Pontiac dealer, and when Earl came down the hill (in his ‘62 Chevy Bel Air with a 283 bored out to 301 with 13/1 popper pistons and Isky no-float cam milled head 4-speed), he saw a ‘67 GTO on the dealer's lot. In conversation with a salesman, he learned that it was a 400 4-speed with lots of power as it had no extras (no A/C, no power steering, no power brakes). He took the car for a test drive, and, after much negotiation, he bought it. Earl kept this car for five years before selling it to his brother in 1972 for $450. The brother blew the engine and wrecked the car twice. Now it’s 2003, and Earl had wanted another GTO for a long time. His wife Barb made a deal with him: give up smoking, and he could have a GTO. All he needed to do was find one, which was easier said than done. The search began with one only two miles from his home in suburban St. Louis, Missouri. It was in pretty good shape and acceptable to Earl, but he could not come to agreement on a price with the seller, so he left without the car. Earl then checked out two other GTO’s or supposed GTO’s (one turned out to be a LeMans), one in Minnesota and the other near Chicago, but neither was acceptable. Earl and Barb were about to leave to look at a fourth car when he heard from his son that the seller of the first one he looked at (his son had originally put him in contact with this seller), the one that was only two miles away, was ready to deal. So they turned around, went back to look at the car again, and they came home with it. Restoration then began and included a new vinyl top, engine dress-up and detailing, side pipes, new windshield, headers, MSD box wires, new flywheel and clutch, and a new paint job. Since the restoration, Earl and Barb have joined the GTO club and have taken the car to numerous local shows as well as the GTO Nationals in Daytona Beach, Florida one year. They continue to drive and enjoy the car to this day. Among the tasks performed as part of the car's restoration was the application of a new coat of paint. The engine compartment, featuring a Pontiac 400 with 4-barrel, needed only some dressing up and detailing. Among the few things the car needed was a new windshield. Side pipes were added as part of the car's resurrection. 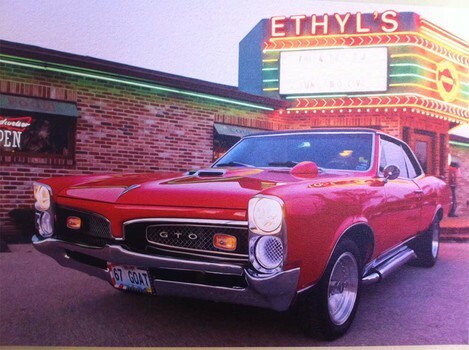 Earl's '67 GTO is a multiple award-winner at both local and national shows. GTO tribute model Earl also owns.